Almost every small business, 81 percent, is on social media, and 94 percent of them use these social platforms for marketing purposes (attracting clients and building a brand), according to research from LinkedIn. As social media usage becomes ubiquitous, the rate will only continue to grow, as more small businesses use Facebook pages and Twitter as their main platforms for communication, even more so than their websites. The LinkedIn study and SumAll data further find social media’s importance to “hyper growth” companies (those with significant year-over-year growth). Ninety one percent of these firms said social media grew awareness, and nearly three quarters grew their social media budgets in the past year. The small businesses using social platforms must be doing something right. Once small businesses are on social media they need to then figure out how to leverage each platform to meet their goals. These types of companies don’t have the luxury of spending too much time on any facet of their business. Small businesses want to be sure their content is engaging and impactful, and will have “legs” throughout the network in terms of additional sharing. What many small business owners and managers overlook is the “when” of social media posting, not just the “what,” “where” and “why.” Having the right content is great, but knowing the time of day when people are most receptive to posts is invaluable for companies that need to run efficient campaigns. SumAll.com is a startup firm that provides data analytics for companies ranging from small businesses to large enterprise-level players such as Starbucks and Pandora. The company analyzed large amounts of customer data to determine the most opportune times to send out posts to various platforms, including Twitter, Facebook, Tumblr, Instagram, Pinterest and Google. The “best time” metric was calculated for each social media platform by measuring the responses on hundreds of millions of different posts, representing companies in various industry verticals. The measured “responses” were likes, comments, reposts and other similar activities that represent a specific action taken by the recipient. 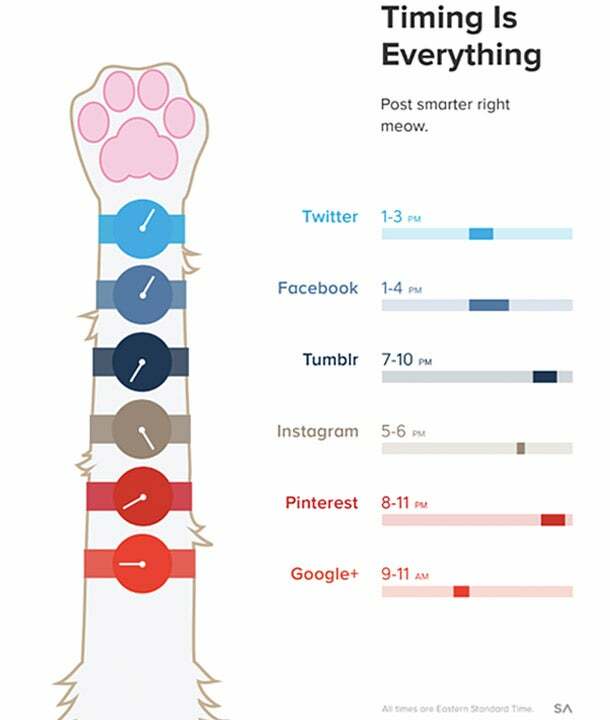 The SumAll.com research found the platform-specific times illustrated in the below infographic were generally optimal for sending posts. Some thoughts on the likely reasons for the popularity of the specific timeframes will follow. Twitter: People have a chance to share their own thoughts or retweet in the afternoon. Facebook: The work day is slowing down and people have more time to do a Facebook check. Tumblr: Reading micro-blogs on Tumblr takes more time and thought than other platforms, so non-work hours are often ideal. Pinterest: Weekends are best, as the craft and collection emphasis of Pinterest lends itself to weekend projects. A common trend with the optimal times is you want to catch people during their downtime. You might need to get them early in the morning during their commute or “settling in” time at work, during lunch or in the evenings. Small businesses should try to follow these times but also need to understand the timing may be different for their specific customer base or industry. If they are trying to reach college students, the normal 9 to 5 workday doesn’t apply. Experimentation is still recommended, and small businesses can use various tools to automate the sending of posts and tweets at various times throughout the day and over the weekend.